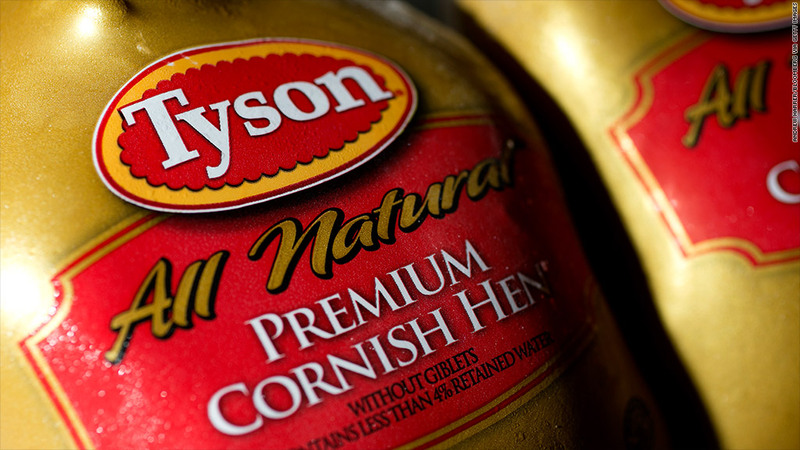 Meat processor Tyson (TSN) announced Thursday that it's offering $50 a share for Hillshire Brands (HSH), exceeding the bid from chicken producer Pilgrim's Pride (PPC) of $45 a share totaling $6.4 billion, which was announced earlier this week. "Our proposed price reflects the considerable value we see in such a combination, providing your shareholders with a higher return on their Hillshire investment than we believe can be attained in the near term by the Company either on a standalone basis or in combination with any other food processing company," wrote Tyson Chief Executive Officer Donnie Smith, in an open letter to Hillshire CEO Sean Connolly. Hillshire shares surged 16% in early trading. Tyson shares were also higher. Hillshire is pursuing a deal of its own. The meat processor has agreed to buy Pinnacle Foods (PF), the maker of Birds Eye frozen vegetables and Duncan Hines cake mix. Hillshire said earlier this week that it will stick to its plan to buy Pinnacle, even as its faces a potential takeover from Tyson or Pilgrim's. Tyson, in a press release, said that its offer to buy Hillshire "constitutes a significantly superior alternative to Hillshire's previously announced agreement to acquire Pinnacle Foods."